Explanation: Is that our Sun? The unusual banana-shaped loops shown above are actually part of a computer-generated snap-shot of our Sun's magnetic field. This animated frame was constructed using data from the ground-based U.S. Solar Vector Magnetograph and the space-based Japanese X-Ray Telescope Yohkoh. 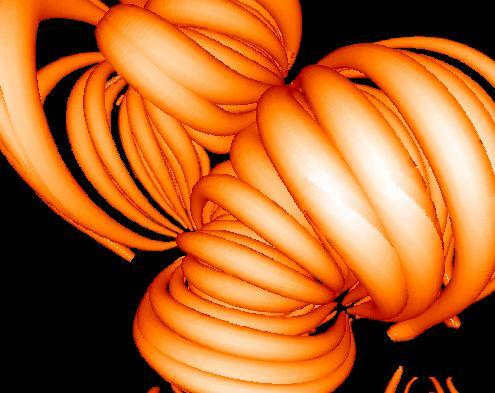 Surfaces of constant magnetic field strength loop through the Sun's corona, break through the Sun's surface, and connect regions of magnetic activity such as sunspots. Recently, contact has been interrupted with the Sun-watching SOHO satellite. Although SOHO had completed its two year mission, attempts are still being made to re-establish communication.